This is something which is probably pretty simple for those in the know, but I never could find it anywhere on the web, so I had to figure it out myself the old-fashioned way. 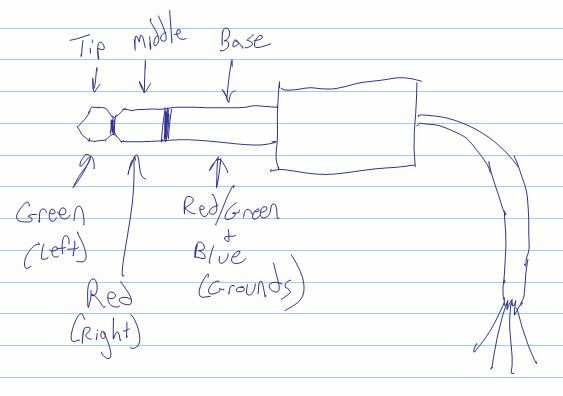 If you have a set of earbuds (or other earphones with mini-jack) and you want to splice on a new plug, or longer cord, or make your own ipod-to-speaker connector, or whatever, you need to know what part of the little plug connects to what. So that’s what I figured out, sacrificing an old (non-working) pair of spiffy white Ipod official earbuds. The little wires are exceedingly tiny, and they’re enameled, so very hard to strip. You can do it by gentle scraping with a razor blade or exacto, or the easier way (which is what I did) is to use a match–the insulation burns right off, producing a wisp of (probably toxic) smoke, and a residue you can wipe off with a cloth. Then you’ve got bare wires to work with. Hi, i randomly stumbled upon your site in an effort to find out how to wire ear buds. I have been having a lot of trouble. have you had success? Thanks for posting this, the diagram will help me immensely. Keep up the good work!! The actual names of the contacts on the plug are Tip, Ring and Sleeve, courtesy of the Bell System. Googling for help and found your site. Replaced plug, L & R channels in proper order. PS, set soldering iron temp to 400C and wires will self tin without stripping. You just saved me so much time – I could not figure out why my ear-bud splicing job wasn’t working! But now I know it is because the individual wires are insulated with enamel!!!! Thanks man!!! Great information, knowing to use a match to burn off the insulation was great… I didn’t know there was insulation. I don’t know much about electronics. Thank you! Used your information to fix my $100 Etymotic ER-6i earbuds by splicing on the stereo plug connector from of a pair of iPod earbuds. Your red/green color info was correct, and once I matched those up and burned off the insulation, everything worked. That enamel! Worked on my dog-chewed earphones for months without success. I did not know that there was enamel insulation on the wire until I read your article. Thanks for the priceless info. What gauge are those impossibly fine wires? They look like hairs.